Phizogs are a new line of cold cast metal Mechtorian wall plaques created by Doktor A. 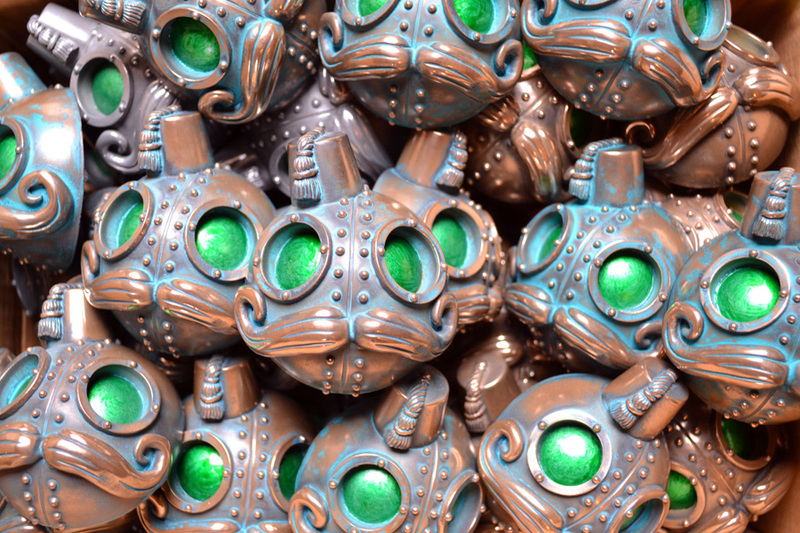 Available in two sizes and three finishes the Phizogs are open edition sculptural pieces for collectors of robotic whimsy and delight. The Mini Phizog is 3″ in diameter and the Midi is 5″. Available in Brass, Verdegris or Pewter finishes. 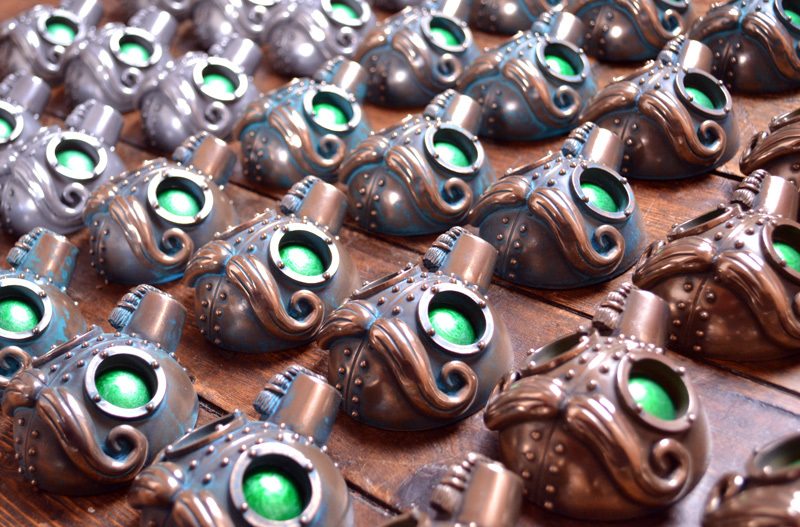 Each Fez toting, moustachioed visage has an antiqued and polished finish with green painted eyes. Lovingly hand made in England by Baroque Designs, each piece is hand finished and signed by Doktor A. An unusual contemporary collectible artwork in a fine old tradition, created to the highest standard possible. Launching at ToyCon UK in London on the 6th or April 2013. 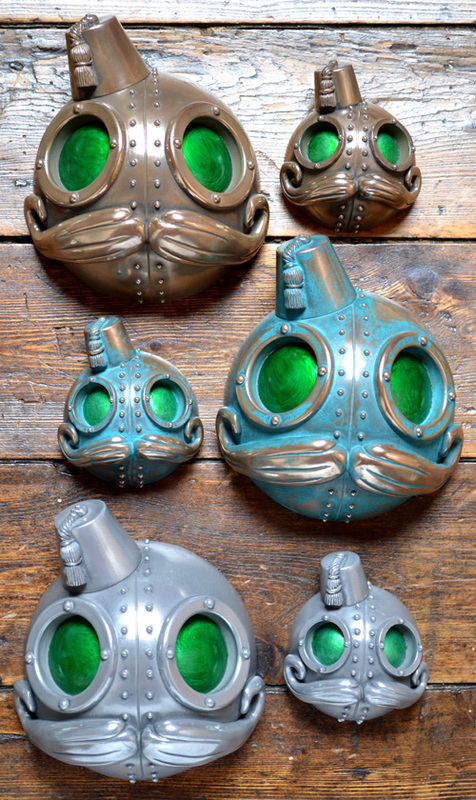 The Phizogs will then be available direct from Doktor A’s online store. £20 for a Mini and £45 for a Midi. 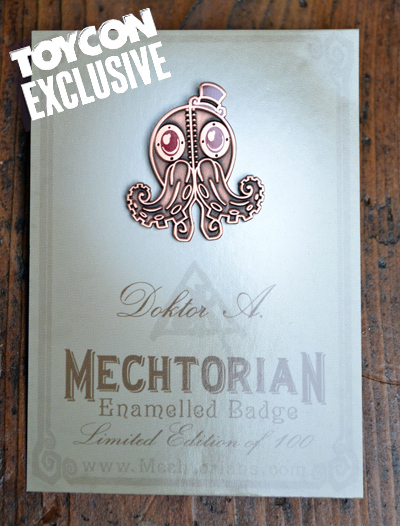 In the style of his best selling line of Mechtorian pin badges comes the first iteration of arguably Doktor A’s most popular character. 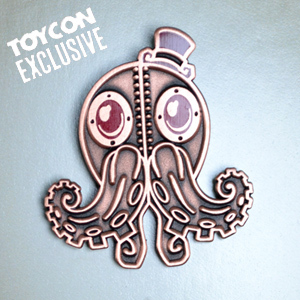 Stephen LePodd the tentacularly adorned, adventuringly daring denizen of Retropolis can now be yours as a relief cast metal pin badge. Polished and partly enamel filled for that classic, vintage look. This piece will be an exclusive release at ToyCon UK in London on the 6th of April. A strict edition of only 100, engraved numbered pieces, the copper and red Stephan can be yours for only £5. Each badge is 1″ across and comes bagged on a display card. Any remaining stock after the event will be made available on Doktor A’s online store.